Looking for a Healthy Living fish recipe that's crispy on the outside, tender on the inside and delicious all over? This lemony tilapia fits the bill! Spray foil-covered baking sheet with cooking spray. Mix coating mix, parsley and zest in shaker bag. 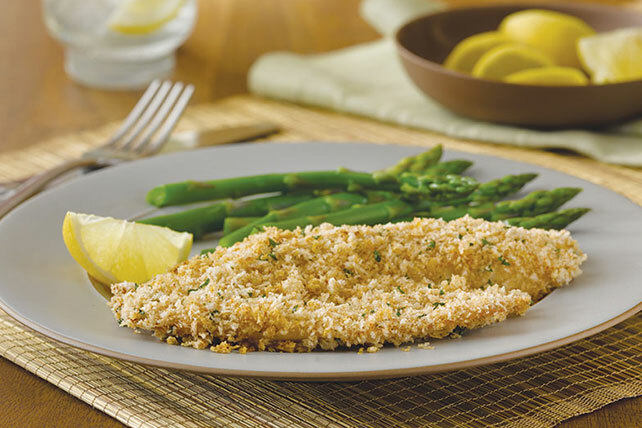 Brush mustard onto both sides of fish fillets, then coat with coating mix as directed on package. Place on prepared baking sheet. Bake 20 min. or until fish flakes easily with fork. Look for fresh fish fillets and steaks with a firm texture, moist appearance and fresh mild odor (they should not smell fishy). Whole fish should have bright clear eyes and red to bright pink gills. Store in the coldest part of the refrigerator up to 2 days.